As spring bursts forth during the months of April, May and June, there are usually some warm and light ‘salad’ days and some, definitely chilly, ‘meat and veg’ days! Whatever the weather this season: a classic lamb recipe like this will not disappoint. (It won’t take all day to prepare and cook either so you can grab the best bits of the day outside! )This recipe for lamb combines the best of both worlds for a springtime supper dish. Fresh local asparagus complements the heavier texture of the meat and brings a subtle light flavour to the meal. When buying your joint of lamb, it’s worth knowing about the place of origin and having a good look at the colour of the meat and fat. 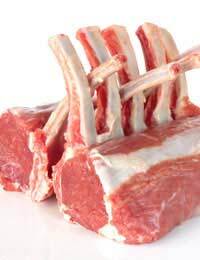 Avoid joints of meat with fat that looks oily or yellow as this may be a sign of excessive age. Meat from a young lamb generally has a pale pink colour, whereas more mature meat may appear a darker red; unless the meat is from one of the hill breeds-when even the young lambs have darker meat. The following recipe uses a boned shoulder of lamb. This is one of the lesser expensive cuts but, when fresh, has a sweeter flavour than the leg. Wash the asparagus and celery (if used) and cook in boiling water until tender. Drain well but keep the asparagus/celery water.Cut off the asparagus tips and put them aside-preferably on a warming serving dish.Place the asparagus stems and celery in a food processor then, whizz them until they are pureed. Trim off excess fat from the lamb joint and cut the meat into 5cm pieces.Put the seasoned flour on a plate then add the lamb pieces to this so that they are covered in flour.Melt the butter in a deep pan and fry off the meat and onions until they start to brown. Gradually add 300mls of the asparagus/celery water and stir constantly to make a smooth sauce.Gently simmer the meat in this liquid for about an hour-skim off any fat that forms a residue on top of the liquid. Add more liquid if needed.Check that the meat is tender before the next stage. Next, stir in the asparagus puree and the cream.Season the sauce with salt and pepper and a squirt of lemon juice. Stir in well.By now the sauce should smell really good and have a fairly thick consistency. When you are ready to serve your meal, transfer the cooked lamb and sauce to a warm serving dish and arrange the asparagus tips around the edge of the plate.This dish is best served with plain boiled, or mashed, potatoes.If you fancy more vegetables with it, some fresh spinach, broad beans, or peas will do nicely; but may detract from the flavour and lightness of all that wonderful asparagus!